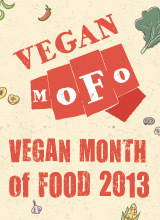 Sooooo, here we go, it’s the Virtual Vegan potluck, I’m at the top of the list…. I feel like I should make a speech or something?? But don’t worry I wont, I will just say its awesome to be part of something that has so many great blogs coming together, don’t ya think so? Hope to get to know you guys a lil’ better! Now onto what I’ve brought to the potluck! 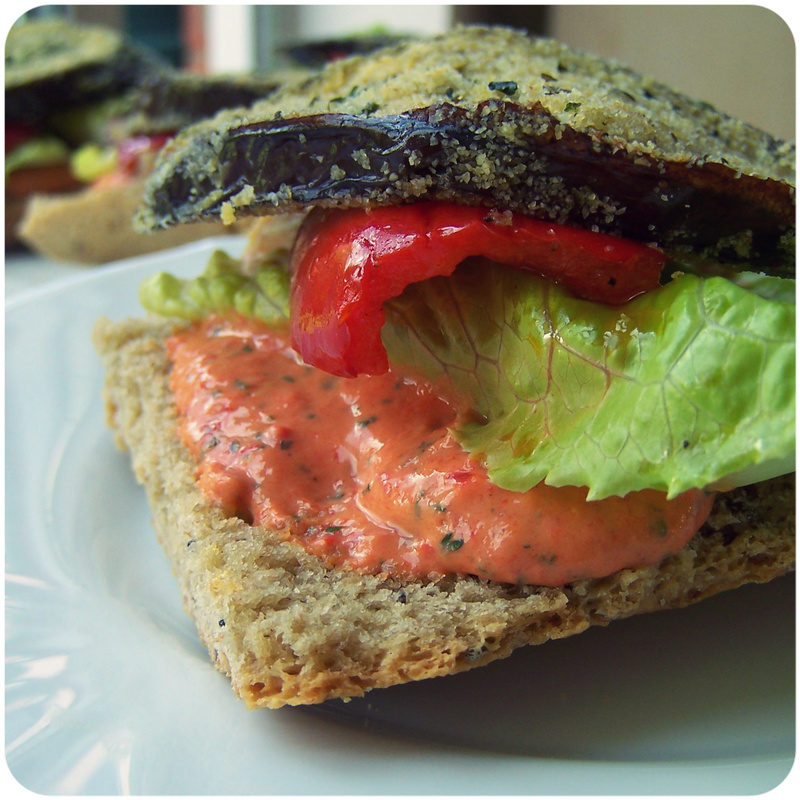 I’ve brought some juicy slices of aubergine crusted in semolina and herbs, stacked with roasted sweet pointed red pepper and lettuce on top of a rather rustic looking slice of ciabatta with a super creamy roasted garlic and red pepper tofu spread (it makes a great dip too!). If you just wanted to make the spread (which I suggest you do, I’ve already made another batch) just use the whole of both the roasted peppers, and proceed with the recipe as normal. Store it in a jar in the fridge and you can serve it as a dip for guests. Great in sammiches where you would usally used hummus (not that I don’t love you hummus, just, we need to take a break). Now everyone enjoy the potluck! Preheat the oven to 200c/400f. Take a roasting dish and toss the red pepper and garlic cloves in olive oil, sprinkle with salt and pepper, and roast in the oven for about 20 minutes until the peppers are nicely roasted. Whilst the peppers roasting, rub the aubergine with a little salt and some black pepper, brush with olive oil. Grab a shallow dish and combine the semolina, herbs and nutritional yeast with a fork, gently press each side of the oiled aubergine into the mix, then transfer to a lined baking sheet and bake for about 20 minutes in the same oven as the peppers. Once the peppers are done, reserve 6 piece of the pepper and add the rest to a food processor, remove the garlic from the skins and add to the processor with the cumin, red pepper flakes, coriander, mixed herbs, red wine vinegar and silken tofu, salt and pepper. Blend until smooth. Dollop the roasted garlic/red pepper/tofu spread onto the ciabatta slices and top with a leaf of lettuce, one of the reserved pieces of roasted red pepper and finally the crusted aubergine. This entry was posted in snacks and appertisers and tagged 2013, food, recipe, vegan, virtual vegan potluck. Bookmark the permalink. Happy Virtual Vegan Potluck 3.0 Day! I love savory spreads, it was yum, and it’s amazing to see a homemade one! I would love to make this with raw nuts, instead of silken tofu, and I bet that will be amazing. I was thinking about doing it with raw cashews in the future, im on my 3rd batch already…. oh dear! Look at all that crispy goodness! Awesome! Mmm, that aubergine looks splendid as does the sauce. All good sandwiches start with a good sauce and this looks like a great one! Way to start the Potluck off with a purple and red bang, Alexander! Gorgeous work! Thanks, im loving your morrocan themed goodness! Speech! Speech! You’ve outdone yourself and I love that you start the lineup! Those look like some very tasty sammiches my friend! So happy to have you here! Alex! I think I just died. That looks so crispy and amazing!!! If you die can I have that funky cup in your post??? Woo hoo! What a fabulous start to the VVP! This recipe looks totally scrumptious! Thanks Ally, im loving yours! This potluck is making me super hungry too… I just want everything for breakfast! These apps are a bit big… ha! I just got up for it too! Lol! Yeah I havnt had brekkie yet, went straight to my computer and now glued to the screen but o sooo hungry! That spread looks so amazing! I will absolutely be making this for our next potluck at work. Great start to the VVP! Thanks! Im still working my way through the potluck, this is tooo much before breakfast, I am getting soooooo hungry!!! You can never have tooo many spread, what is a fridge with out them? That looks amazing and super delicious. I’m lovin the spread…great list of ingredients and has me very hungry! Hey there Virtual Vegan Potlucker! 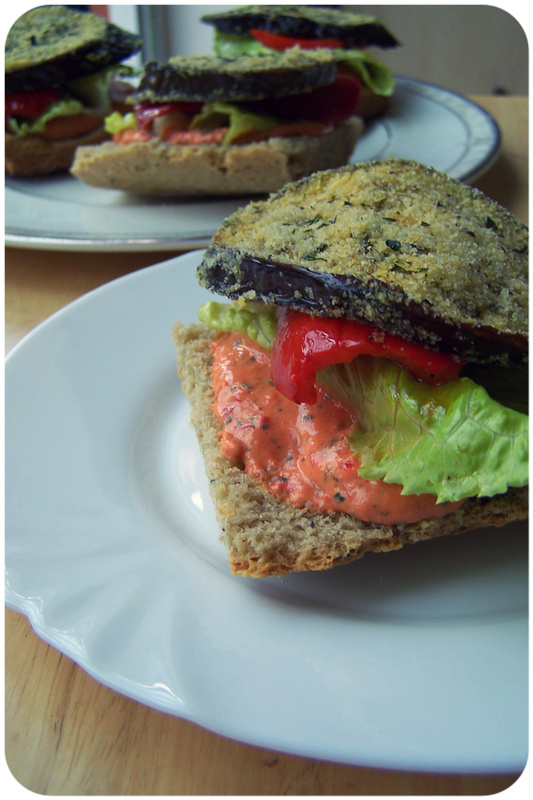 Great recipe, especially roasted red pepper and garlic spread. We’d definitely use that for many dishes! Thanks, ive been loving it on crackers and crisp toasts! Lovely – always think that aubergines are undervalued! Looks so good! Love a layered app. Happy Virtual Vegan Potluck! This looks sooo good! Why am I reading this before breakfast….!? Ha, I read all the VVP posts before breakfast… made me crazy hungry! beautiful! the color of the spread is gorgeous! Such a beautiful looking sandwich. From what I’ve seen of the potluck so far, I’ll be adding lots of recipes to my ever growing list of recipes that I must try. I think ive planned most my meals for the next week with potluck entries…ha! Oh YEAH! So luscious! Thanks, Alexander! You got things started off with a bang! So glad to have you in the Potluck. Its a pleasure to be part of it! That aubergine looks incredible! And your comment on hummus made me laugh a lot because I’m always saying that. I love hummus, but I need sometimes I just need a break! Great job on starting out the potluck! Thank you, and what sane person doesn’t love hummus? Its the buisness! That spread looks really tasty. 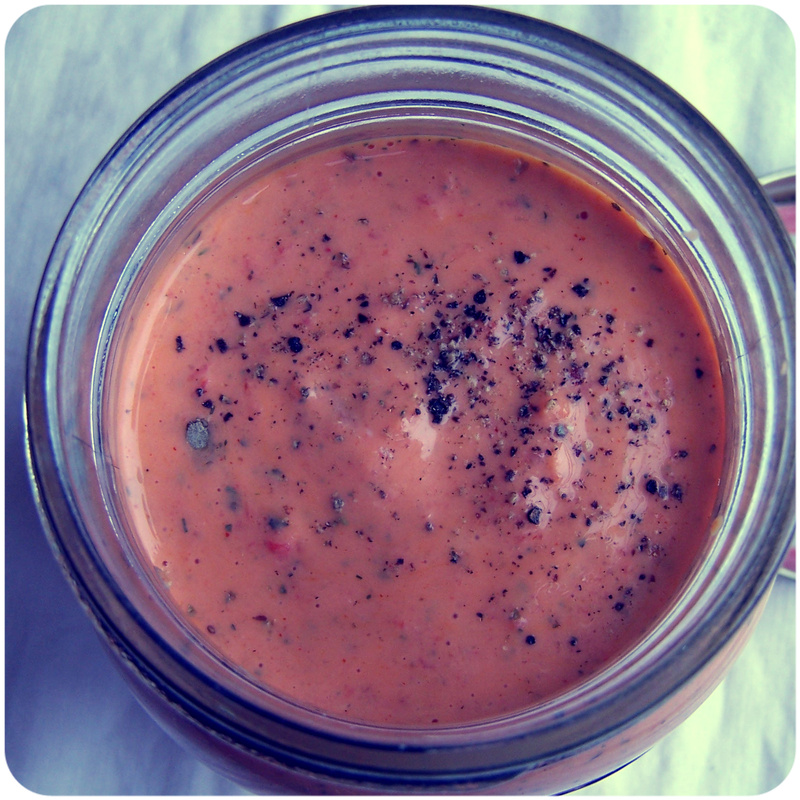 I am just starting to experiment with making vegan creamy spreads and dressings. Will have to try this one! Wow that looks sooo delicious, I’m loving the close up shots of the red pepper. Loving it! I’m a HUGE fan of aubergine, and this recipe looks amazing! What a great start to the VVP. YUM! Aubergines are the way forward! What a great kick-off to the potluck! Thats what i’ve been doing :D, its also getting a lotta love from the non veggies at my boyfriends house! I’ll bet! Who wouldn’t love this! Happy VVP! This looks awesome, what a great way to kick of the potluck! Yum! The spread looks delicious. Yummy! this is totally my kind of appetizer. I could make a meal out of it. Yes..just yes. This looks like the perfect way to start his party! YUM! Wow. Looks great! I’m going to have to try the sauce. Thanks! I ment to make your cabbagey goodness the other day, but sadly didnt! Its on my todo list, cabbage is seriously underloved in this world!!! That crusted eggplant sounds like heaven. Only just started going through the potluck and already my mouth is watering!